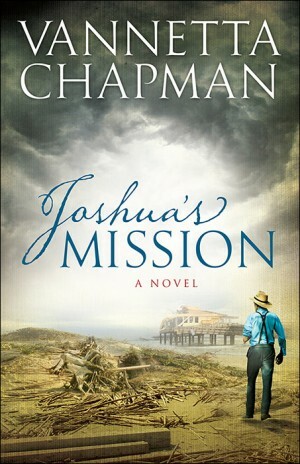 Vannetta Chapman’s new novel has nothing to do with the Amish…or does it? Today we’re chatting with Vannetta about her latest release, which is the first book in a Christian dystopian series. Read on to learn more and to find out how you can enter for a chance to win a copy of Deep Shadows! * * *1. 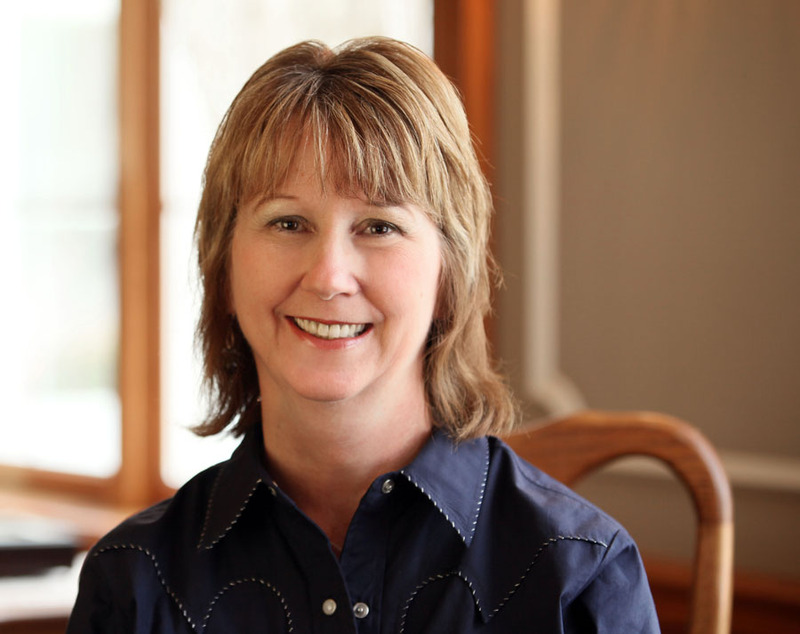 AmishReader: Vannetta, you are the author of Amish romance, Amish mysteries, and romantic suspense novels. How do you switch gears when writing different genres? Do you have a particular genre you enjoy writing the most? Vannetta: I really like writing all of them! I just adore writing stories, and especially hopeful stories…I think we can all use a little of that given the times we live in. I do have different “playlists” in my iTunes account for whichever genre I’m writing. The music for Deep Shadows was quite different from the music for Joshua’s Mission. 2. AmishReader: Deep Shadows, as Christian dystopian fiction, presents a potential (not-too-distant) future world where all modern technology has been wiped out due to a solar flare. While your characters aren’t Amish, what wisdom could they glean from the Amish culture in this situation? 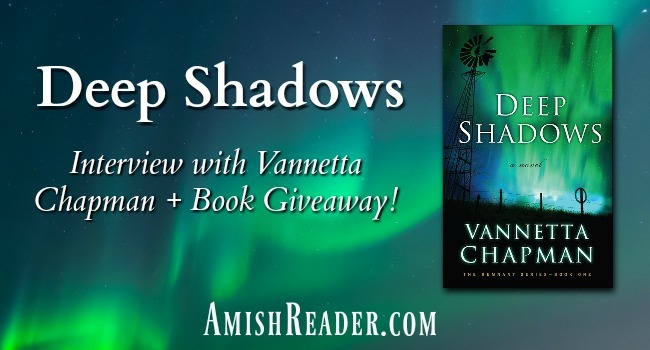 Vannetta: A lot of what I’ve learned from visiting Amish communities helped with my research for Deep Shadows—growing big gardens, using heirloom seeds, helping one another, having a close-knit community, getting by with less, depending on your faith. These are all things that each of us can benefit from, regardless of our circumstances. 3. AmishReader: How does the theme of community, which is often a major part of Amish fiction, play a role in Deep Shadows? Vannetta: So many readers have written to me saying they’d like to have an Amish pen pal, or they’d like to move to an Amish community. I think a big reason for that is we want that sense of knowing our neighbor, of not being isolated! But of course you don’t have to be Amish to be a good neighbor. In Deep Shadows, Shelby realizes that she has become too isolated and that she won’t make it through the trials ahead without the help of friends and neighbors. As Christians, we’re called to a life of community. Remember Christ told us to “love your neighbor as yourself.” If we practice that, we create important connections with the people around us. 4. AmishReader: What are a few essential tips you’ve learned for surviving in a world without technology? Know the name and phone number of one or two neighbors. Have some peanut butter, crackers, and other basic food stocked in your pantry. Be sure you have flashlights with batteries that work. Keep your prescriptions filled—don’t wait until you’re down to the last pill. Have some emergency cash on hand. Don’t let your cars get close to empty. Get in the habit of filling up when you reach a quarter tank. Write out a list of Bible verses that you can turn to during hard times. 5. AmishReader: What are some features of Deep Shadows that fans of your Amish fiction would appreciate? 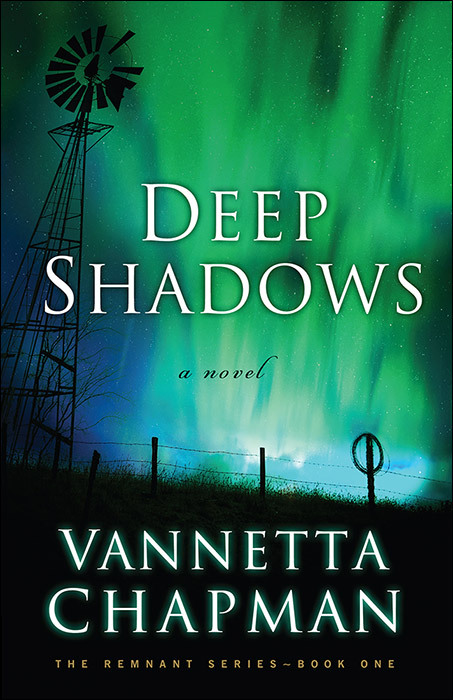 Vannetta: I’ve received such wonderful feedback regarding Deep Shadows, much of it from my Amish fiction fans. They especially enjoy the sense of community, the way my characters’ faith grows during tough times, how the story is realistic and yet hopeful. God’s grace is a theme that I try to carry through each of my books, and I felt like it was a very important part of Deep Shadows. AmishReader: Thank you so much for joining us today, Vannetta! Life in Abney, Texas is predictable and safe—until the night a massive solar flare wipes out all modern technology. As the brilliant northern lights give way to deep shadows, single mom Shelby Sparks, her former sweetheart, and their entire small-town community must find a way to survive. Enter the drawing for a chance to win a paperback copy of Deep Shadows using the form below! *The giveaway is open to US residents only (due to shipping costs). The form will close at midnight on August 2, 2016. Good luck! Thanks, Ola! I think you’ll enjoy it. Enjoyed hearing how Deep Shadows and Amish fiction aren’t as far apart as I thought. Looking forward to reading Deep Shadows! Hi Jennifer. I didn’t realize they had so much in common until my fabulous editor pointed it out. I just love writing stories, but she’s right. There is a lot of common ground. i have not been a big reader of amish books, however this one sounds like it would be good to read. would love to win it. Hi Brian. Deep Shadows isn’t Amish at all, so you might like it. However, it does work through ways to live “off the grid” which the Amish have been doing for decades. HI Patricia. Thanks for stopping by, and I’m so glad you’re enjoying my stories! Deep Shadows sounds so interesting. Thanks for a chance to win a copy. I just love your writing. Have a blessed day. Interesting post. You talking about the power being down, I remember we had an ice storm and the power was down for three days. I was like a mad woman trying to empty my stand-up freezer and refrig. freezer not knowing how long the power was going to be down. Packed everything into giant cooler and drove to my mother’s and sister’s to pack it in their freezer to save everything. Hi Karen. Yeah, if you take a temporary shortage scenario and then carry it out a bit farther…you understand the scenario for Deep Shadows. I do believe we’d survive it, but there would be major adjustments. Thanks for stopping by and commenting! I’m looking forward to reading this book. It’s a relevant topic for today. HI Nancy. I think it’s relevant too. Every week I see another news story about the vulnerability of our power grid. It doesn’t mean it WILL happen, but it’s something we should have a plan for. Thanks for stopping by the blog! To lose power for more than a few days would be rough. We have a whole house generator for just that reason. I’d syphon gas out of the motorhome to keep it running if needed. I think my biggest concerns would be maintaining a safe temperature in the house (especially in the winter) and food storage. How about you? As for keeping cash on hand, I have a mason jar full of coins. Does that count? I might do better bartering chicken eggs for what I need. I never read mysteries until’ I read yours .Keep writing so I can keep reading !! Love everything I’ve read of yours. Although I love your writing, Vannetta, I wasn’t going to read this book. I don’t know what I thought dystopian meant, but I didn’t research it. Now, however, I am fascinated by the plot and I MUST read it. I enjoy your Amish books Vannetta and I think its wonderful that you are branching out into another genre. I think it really shows an authors creativity. I love your books. Really enjoyed Joshua’s Mission. Great book. Will look for Dark shadows IF I don’t win this time. Deep Shadows is a story about something that might happen, but with today’s dependence upon or energy grid, water purification, & manufacture of our food…Watch out! Thank you for providing a giveaway.